Is Work-Life Balance Possible for Business Travelers? If you travel frequently for business like I do, you might find it difficult to maintain your sense of work-life balance. For starters, the very fact that you’re traveling for work means that the work-life balance scale is starting to tilt more heavily on the “work” side. But on top of that, I often have to scramble to get stuff done before I go…and then work seemingly twice as hard when I get back to catch up. I realize this may only happen to me, and is probably not something that you can relate to. So not only am I gone for a few days or a week, but I can tend to be “gone” a few days before and after the trip too…”gone” mentally, anyway, if not physically. I’ve been thinking about work-life balance for business travelers quite a bit, because I’m not so happy with how things have been going for me. I knew I traveled a lot at times, but didn’t really think about how much. I guess the fact that I re-qualified for Priority Club’s Platinum level for all of 2011 – by June of 2010 – should have been a clue. That’s a lot of nights away from my family. Though there are some times when I can bring one kid, my wife, or everybody with me. I don’t always eat right. I tend to stay at Holiday Inn Express hotels a lot (hence the Priority Club Platinum status), and I’m a big fan of their cinnamon rolls. So big, in fact, that I used to eat two of them. Which caused me to become a “bigger” fan, if you know what I mean. I curse the day I looked up the nutrition info online and discovered they have 410 calories and 22 grams of fat, though I guess I should be glad I found this out. I always thought it was OK to eat just one (or two) because I don’t travel too often. But I really do travel a lot at times, and the calories and fat can add up fast if I eat just one. OK, two. And that’s just breakfast…not to mention the other restaurant food I might eat while away from home. I don’t always exercise. Just about every hotel has an exercise room and a pool. I’ll tend to use the pool quite a bit, but don’t always knock myself out to make it a real workout. And I don’t typically use the treadmill. Many of my trips are driving trips, and when I drive, I tend to drink a lot of pop (soda for you folks in the south) and McD’s Sweet Tea. I was gone six out of the last seven nights, and drove about 3,000 miles. That’s a lot of time sitting on my you-know-what, drinking a lot of pop and sweet tea. I can get REALLY backed up on email when I travel. I can get behind on personal or home projects. And I’m really behind on some of these right now…and it’s costing me money, because of my travel. Just by making this list, I can see the toll this travel is taking on my body and health. Eating a lot of restaurant food, drinking all that pop, and not getting enough exercise, is not good. I need to find some ways to bring more balance back to my life, and especially to the life areas of health and family, when I’m traveling. Be sure to make enough deposits before I withdraw. By this I mean that I can plan ahead and spend more time with my family, and more time exercising, before I go away on a trip. I think I’m pretty good, at times, in connecting in meaningful ways with my family before I leave on a trip. But I’m sure I can do better. And I know I can do better at exercising more before I go! Ask my family “How am I doing?” more often. I got this idea from Ed Koch, former mayor of New York City, who was famous for going around town asking, “How am I doing?” of just about everyone he met. If I ask them, my wife and kids can tell me if they that I’m connecting enough with them before I go, and even during trips. Make exercise a priority. Most times, there’s no reason why I can’t run on a hotel treadmill for a half an hour. And in good weather, if I have the time and transportation, there’s no reason I can’t find a trail to hike, which is something I enjoy doing when I can. Decide in advance what food options are good for me, and keep track of what I eat. 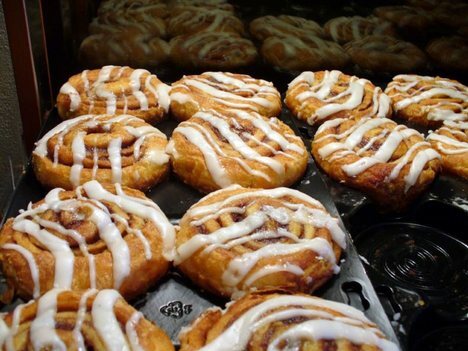 I’ve realized that I could have a cinnamon roll just once during a trip, instead of having one (OK, or two) every morning. And I could decide ahead of time what kinds of food are good options for me when traveling. On my trip last week, I ate Subway almost every day for lunch, which I think was a pretty good choice. Drink more water. I tried to drink more water on this last trip, I really did. But Coke habits are hard to break. I’m 40 years old, and I can remember when you didn’t have to pay to drink water. So if I have to pay for something to drink, it may as well have sugar in it too. One tip I’ve learned is that I can stop into any grocery store, or Target or WalMart, and buy a gallon of drinking water for anywhere from 60 cents to $1.09. Might not be cold, but it is MUCH cheaper than buying one of those tiny bottles of water for $1.00! Plan ahead more at work. I know I’ve got to think farther down the road, and not put off certain things or projects until the last minute when I’m about to hit the road. And I know I can delegate more of my work to others. These are some of the things I’ve been thinking about regarding maintaining a more balanced life while traveling for business. What else would you add?